The Summer School will be held in Rijeka, Croatia from 2.7.-10.7.2019. and will include 11 hours of lectures held by some of the best experts in the field of hyperbaric medicine in Croatia, and a diving class that will include 5 dives after which you will be awarded an official international certificate for diving up to 18 meters. We have also organized an amazing social programme for you, including an Opening and Closing Ceremony, a National Food & Drink party and many more. You will be taken to see the world famous Plitvice lakes which is a UNESCO heritage site and we will show you all the beauties of our city and its surroundings. You will also have an exclusive visit to the JGL Manufacture facility, a medical research company situated in Rijeka which has specialized in making products from the seawater of our beautiful Adriatic sea. We are accepting only 16 students since we have focused on quality and not quantity so hurry up with your application . In our Program you get an unprecedented certified hands-on experience guided by some of the best medical professionals in Africa & the Middle East all together mixed with a chance to relive history in the heart-capturing and mind-blowing cradle of civilisation -EGYPT- where you will taste the flavor of life in Egypt as an Egyptian surrounded by the friendly locals and your new local friends that will have your back 24/7! Time: 16th of July to the 27th of July 2019. Number of Participants: 30 up to 45 Students. Deadline for Early Registration: 30th of March 2019. Deadline for Late Registration: 30th of April 2019. 600 Euros for Early Individual Registration. 650 Euros for Late Individual Registration. What will course fees cover? -Professional Certified Scientific Course at Faculty of Medicine - Suez Canal University, Suez Canal University Teaching Hospitals, Infectious diseases Hospital & Chest diseases Hospital in Ismailia, Egypt. -A priceless opportunity to gain fruitful hands-on experience about Infectious diseases and Tropical medicine. -Variety of interactive classes, clinical sessions and lectures given by a mixture of very talented young doctors and competent professionals. - Extravagant Accommodation at 5-STAR Hotel in the Magical Ismailia, with its Breathtaking Sea View, Fully-equipped Gym, deluxe playing fields, lavish Pools, Fancy spa, Excellent property & even better staff! -Transportation during the whole Summer School period in fancy air-conditioned buses. -2 fancy meals per day (A delicious breakfast and luxurious lunch), during ALL working days. -24/7 Support by SCMSA’s own ready, willing and able local medical students. -Moreover, a spectacularly diverse SOCIAL program All over Egypt. -NFDP & Social program inside Ismailia. -OPTIONAL Half-day Sandboarding trip to Fayyoum. -OPTIONAL 5-day trip to Dahab, Sharm & Mount Cartherine. Tolip ElForsan island Resort & Spa - A Splendid 7-STAR Hotel Chain All Over Egypt. -A white Coat and a Stethoscope. -A Camera will come in handy as well! -International Student Card (ISIC) is recommended. 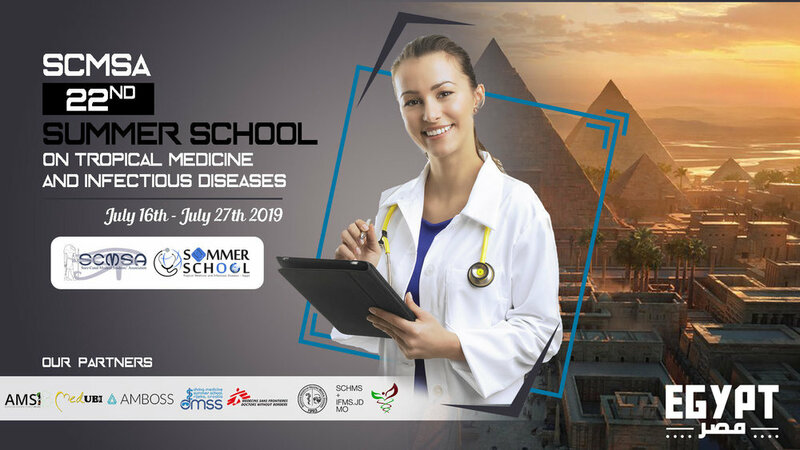 The ADAM Summer School is a medical summer school, organized for medical students from all around the world. During the week we will combine an interesting educational experience with a fun social program! The medical programme of the ADAM Summer School focuses on anesthesiology and acute medicine. You will attain practical skills through simulation, for which the practical sessions take place at the Simulation Center of the VU University medical center in Amsterdam. Not only will you be simulating, there will also be opportunities to develop other skills, such as performing intubations and coniotomies. Furthermore, you will visit inspiring lectures and workshops. After this course, you will be able to handle stressful situations in the operating theater and in the shock room. ADAM Summer School is all about practicing and learning: education through medical simulation! Ever wanted to have lunch in the Vondelpark? Or make a city tour through Amsterdam? During the social programme, you will explore the beautiful capital Amsterdam! There is much to discover with the rich history, culture and nightlife that Amsterdam has to offer! Also, you will have plenty of opportunities to connect with your peers from all over the world. This all will make your ADAM experience unforgettable and worthwhile! The registrations are OPEN since 7th January 2019. Please note: We are accepting second, third, fourth and fifth year medical students. We are taking into account a maximum of 100 applications, once we have received 100 applications, the application form will be closed early. Included: housing and breakfast for 7 days, lunch and dinner for 6 days, airport pick-up service, medical & social programme. For Dutch students housing and breakfast is not included. After the deadline for registration, we will go through all the motivational letters and evaluate who will be able to participate in this year’s Summerschool. You will receive an email informing you about whether you have been selected or not. After this email, you will be given two weeks to complete the payment. Otherwise we are unable to guarantee you a place in the ADAM Summerschool. You will receive a second email confirming your place when your payment is received. For some countries an official visa is required to enter. It is the responsibility of the participant to acquire one if necessarily before the trip departure. The 18th edition of the ICMS is open for registration, will take place between 9th and 12th of May in Sofia, Bulgaria. We are looking for passionate, eager to learn and grow young scientists! We are looking for you! For any inquiries you can always send us an e-mail. We are happy to announce that we are having our Summer School of Emergency Medicine again next year, where you can expect to expand your knowledge – one you might not find in your textbooks. The scientific part is composed of lectures, interactive seminars, practical skills and daily cases. Every student will have a chance to renew and expand his/her knowledge, as well as master new skills. Early participation fee: 400 EUR including: accommodation for 9 nights and 10 days, food, trip to National park, Žabljak, workshops and lectures.